Realtor Leah Regan said other names considered included "Maple Point" and "Murder Heights Village." BALTIMORE—In an effort to revitalize several distressed areas of the city, a coalition of local real estate developers announced ambitious plans Monday to rebrand Baltimore's historic Murder Heights district. "This community has rebounded tremendously in recent years, and we feel the name Murder Heights—due in part, perhaps, to the neighborhood's somewhat checkered past—may carry with it some negative connotations," said local builder Lawrence Vitali, speaking to reporters from the construction site of an upcoming condominium complex. "We'd never wish to overshadow the rich cultural vibrancy that has always made Murder Heights a unique and exciting place to live, but we believe the area's bright future is better reflected by the name Oak Hill." "From Blunt Force Trauma Avenue all the way down to Corpse Dump Pier, it's the dawning of a new day for this beloved neighborhood," Vitali added before getting into his car and speeding away. According to local historian Charles Younger, Murder Heights was named for one of its first settlers, Jonas Rutherford Murder, who built a home in the area in 1798 and, along with his wife and six children, was massacred by Powhatan Indians in 1801. Following several decades of colorful history, including the infamous "Night of the Ice Picks" in May 1877 and the widespread piano-wire garrotings of the 1920s, Younger said the district began a precipitous decline. 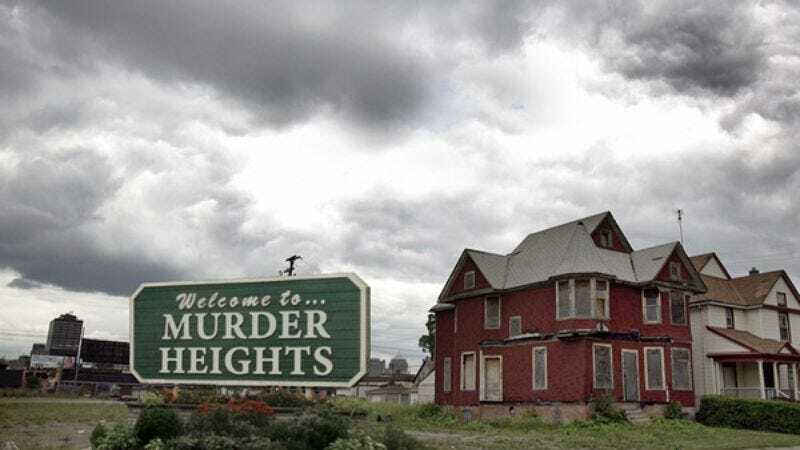 "Murder Heights has gained some ground in recent years due to a small but steady influx of more affluent home buyers," said Younger, who grew up in the area and still has use of his left hand. "With any luck, improvements such as the new computers in the Sexual Assault Municipal Library and the cleaning up of Throat-Slit Children's Park will continue to help the neighborhood forge a new identity." The intersection at the newly renamed Marigold Square. The rebranding effort has many in the real estate industry feeling optimistic about increased property values. Leah Regan, an agent at the Century 21 Murder Heights branch, pointed out several new amenities in the area that she believes will be attractive to prospective buyers. "An empty lot on the corner of Decapitation Street and Eye Gouge Boulevard was recently transformed into a hip new coffee shop and bookstore," Regan said. "It took police 18 months to investigate and clear the 84 homicide cases uncovered when ground was broken on the two-acre site, but Oak Hill Java Company is finally up and running." "This is a great place to raise a family," Regan added. Regan also said that the long-defunct Lister–Finestra–Thompson–Ditmas–Krantz–Students of P.S. 283–Rodriguez–Stapleton–Tillson Memorial Public Pool will likely reopen in time for the hot summer months. Though most Baltimore residents have supported the rejuvenation of the blighted neighborhood, a small but vocal contingent has remained resistant to gentrification. "Our rents have started going up, and there are a lot of people here who want the neighborhood to stay the way it is," longtime Murder Heights resident Philip Lindquist said as he wiped blood from a rusty hacksaw. "Folks like myself, with the help of detrimental social policies, gross neglect, and semiautomatic weapons, have worked hard to make Murder Heights what it is today. And let me tell you, we're not going any—"
Lindquist was unavailable for further comment after he was shot in the head five times at point-blank range.